Is there a shorthand/ instruction for math mode to simply retain words and not collapse the whitespace? I.e. rather than manually inserting spacing after each word with \, and friends. That seems like too much manual work. The following screenshot provides solutions for both inline math mode and display math mode. The solutions rely on the \text and \textup macros. \textup (or \textnormal) should be used for variable names; that way, they'll get typeset in the upright regardless of whether the surrounding happens to be typeset in italics (say, because the material occurs in the body of a theorem). I also suggest replacing \o with \emptyset. Here I define textequation* (based on equation*); a textequation version for numbering is similar. I also increase the baselineskip, which is common in displayed material. The optional argument (default 0.8) is a factor for setting a width, see the example below. Using a special command for the “textual variables” is recommended, so you don't have surprises when typesetting them. While I will keep an eye out for some further improvements, this will likely be the approach for the near term. Not the answer you're looking for? Browse other questions tagged math-mode pandoc white-space or ask your own question. 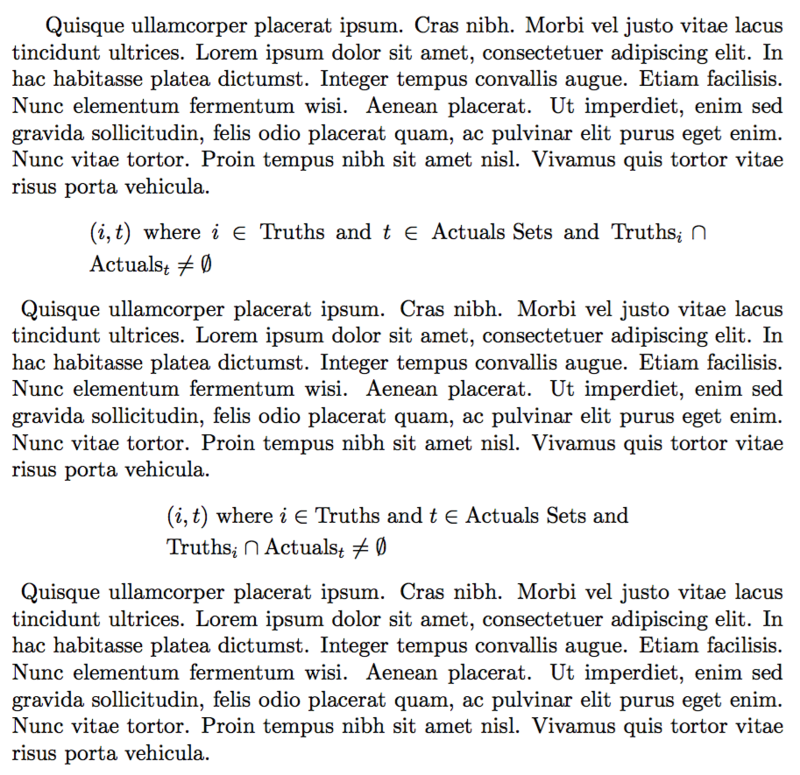 How can I streamline insertion of LaTeX-math-mode symbols in AUCTeX?